Sure, every guy is always working hard using the best exercises for sculpted six-pack abs. But when winter comes and all those long-sleeved shirts come out, all that hard work goes undercover. Fortunately, you can always roll up your sleeves—and that means showing off your big, ripped forearms. They’re one of the few muscle groups that get attention year-round, and since they’re all anybody will be able to see for the fall and winter seasons (without getting to know you better first), it makes sense to invest in them. The following routine might seem a little unconventional while you’re doing it, but it’ll deliver thicker forearms in a month’s time. You already know wrist curls, so while we do employ them, we’ve got different and better exercises for blowing up your forearms. 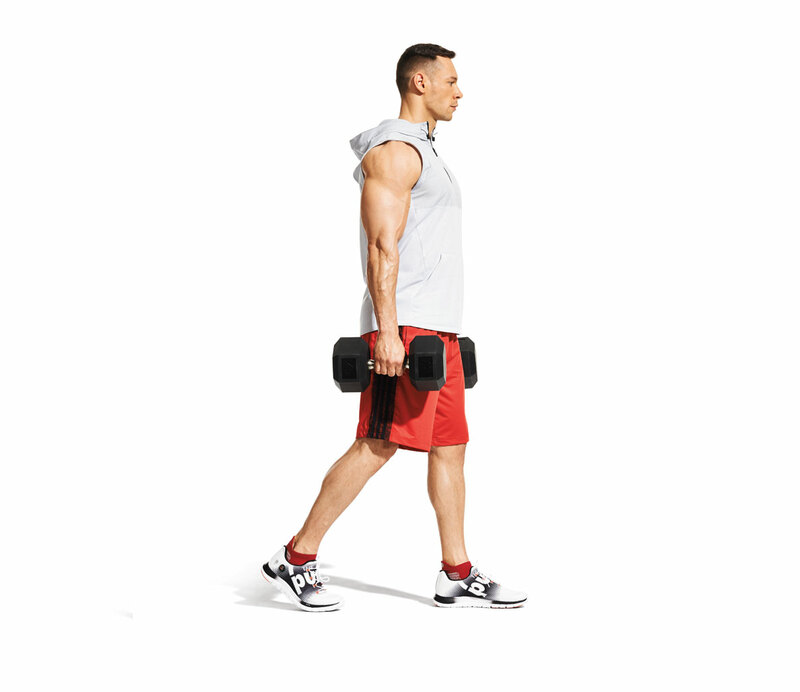 The farmer’s walk is a great overall strength builder that will work your grip and forearms with heavy weights. And we got very creative with the towel wring-out. Repetitive squeezing, twisting, and gripping are a part of most labor jobs, and it accounts for the impressive forearms you often see on working men. We applied the same principle to wringing the water out of a wet towel to make your arms develop likewise. Pair each workout (Days 1, 2, 3, and 4) with one of your normal training sessions and perform it at the end. Complete all exercises as straight sets—finish the prescribed sets for one move before going on to the next. Reps: Walk for 20 sec. Pick up the heaviest set of dumbbells you can and hold them at your sides. Stand tall and walk with them for the prescribed time. Take a heavy-duty rubber band and put it around your fingers. Spread your fingers apart as far as you can and slowly close them. up. Your elbow should be bent 90 degrees. Let the dumbbell hang down, and then curl your wrist up so your palm faces your biceps. Keep the movement slow and strict for all reps.
Bend your right elbow and clasp your left hand over the fingers on your right hand (4A). Gently bend your wrist back so the back of your hand is closer to your forearm, then extend your right arm to feel the stretch (4B). After 60 seconds, stretch the opposite muscles (4C), bending your fingers and wrist so your palm is closer to your forearm (4D). Rest your left knee and hand on a bench and grasp a heavy dumbbell with your right hand (1A). Keeping your back in its natural arch, explosively row the weight to your side—you can use less-than-strict form (1B). The weight should be heavy enough that you could do about 10 reps strictly, but that with some momentum, you can get more than 15.
a box or a bench, allowing your elbow and forearm to rest on your thigh with your hand dangling off your knee, palm down. Curl your wrist up so the back of your hand faces your biceps at the top. Place a lacrosse ball (or baseball or tennis ball) on a box and rest your forearm on the ball with your hand palm-down. Push your forearm into the ball and slowly roll from wrist to elbow and back. Repeat several times, turning your wrist slightly so you can massage different tight tissues. Then turn your arm over and repeat on the other side. Perform as described in Day 1. Grab a wrist roller (it looks like a wooden dowel with a rope in the middle attached to a weight) and hold it straight out in front of your body with a palms-down grip. Roll your hands forward in an alternating fashion until the rope winds all the way up the dowel and the weight is raised. Reverse the motion to lower the weight. That’s one rep.
Place two hexagon-shaped dumbbells standing up on the floor. Bend down and pinch the head of each weight with your fingers—like you’re trying to palm a basketball—and lift them off the floor. Hold them for the prescribed time. Reps: Work for 60 sec. Attach a towel to a pullup bar and grab an end in each hand (1A). Hang from the towel and pull yourself up until your chin is higher than your hands (1B). If that’s too hard, just hang from the towel for 30 seconds or as long as you can. with fingers on top to perform the opposite motion. Curl your pinkie toward the underside of your forearm. to the pulley on a cable machine and thread it through as described for the cable thumb curl (left). Grasp an end in your left hand, thumb facing the machine and palm up. Step back to put tension on the cable and sit on a bench or box. With your elbow bent 90 degrees, rotate your wrist inward till your palm faces down. Complete your reps, repeat on the other hand, then return to your left hand and grasp the rope so your thumb faces the machine with your pam down. Rotate your wrist outward till your palm faces up.